The apartment is in a great position on the edge of a small town, with views of breathtaking countryside. The space inside itself is very spacious with all of the amenities you would need (and more). It has been tastefully decorated and renovated to a high standard. The owner and the housekeeper were very friendly and always on hand to answer any questions. Great value for money and highly recommended! "The apartment is beautifully furnished and well equipped. It is large, spacious and very clean. Huge impressive stone walls and wooden beams on the ceiling. Historic furnishings complement the beautiful atmosphere of this wonderful place. The apartment has a wonderful view of the countryside. Chianni is a small town, but it has everything you need - Italian bar, shops, restaurants. The hosts are extremely friendly and welcoming. Wonderful holiday, I would recommend this apartment to everyone!" "This apartment was absolutely beautiful! It is great for families or You can easily accomodate three couples. We loved the views and peaceful surroudings. Owner is very friendly and he speaks good english so there is no problems communicating with him. At 100 km radius there is many nice citys to visit, so if you have a rental car, you can make nice day trips. We enjoyed our stay , and hopefully some day we'll return to Chianni. "A lovely, spacious and fully equipped apartment with amazing views over the hilly landscape, perfectly situated for exploration of Northern Tuscany. The owner is very friendly and attentive, always ready to help or advise. Simply a perfect place for a peaceful holiday!" "Beautiful renovated apartment in the gorgeous Tuscany area. We arrived and the owner met us at the Pisa airport and showed us the way. In the middle of the week he showed up with pasteries and to see if we were happy with the accomondations. No question about it! We highly recomment this wonderful apartment in this beautiful area of Italy. Everything you need is in Chianni (stores, bank, restaurants, gasstation etc)." "Chianni is a quiet village near Pisa and in easy driving distance of places of cultural interest.The local people look on with friendliness and curiosity.The village is perfectly maintained and placed at the top of a hill. The flat is spacious and commands the most breath-taking views. It is cool and well-ventilated. The owner has renovated the property with attention to detail and authenticity and has created a very comfortable and attractive environment with all the mod-cons without compromising any of its rustic charm. The owner was friendly and helpful. He met us in Pisa and accompanied us to the flat.He kept in touch with us during our stay whilst respecting our privacy.He does not live on the premises.We arrived to find a basket of goodies awaiting us plus salt,vinegar and other useful commodities thrown in. Our stay ended all too quickly and we will certainly return here. There were only three of us but actually there are three bedrooms, so it could sleep 6.The cost quality relationship was excellent and as we live in Italy we know the prices very well.We will definitely return here." 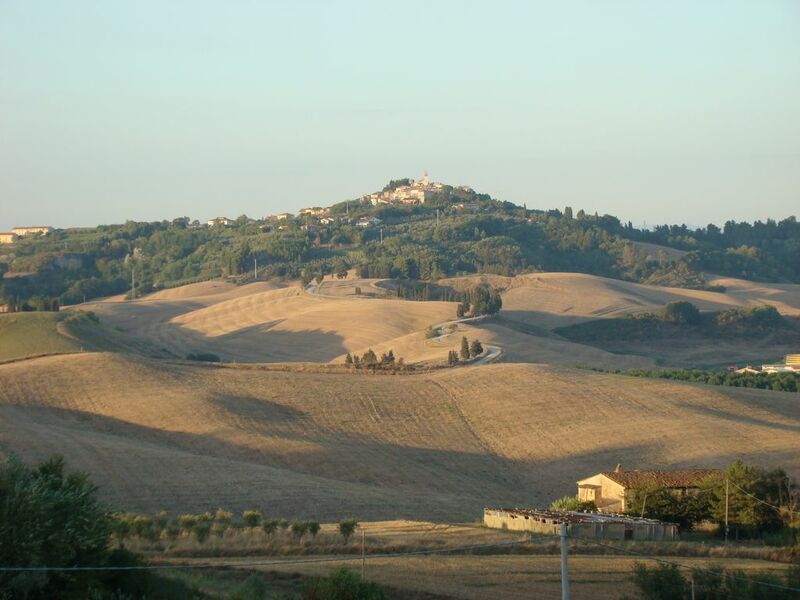 In the heart of Tuscany, the country of Chianni is currently oriented traditional values in the region. Agriculture is the main activity: wine and olive oil can be purchased directly from producers. The kitchen (which uses mainly local products) and the culture of good wine are two strengths of the culture of the place. Despite being a location near the coast (30 km.) from which you can arrange a trip to Isle of Elba, is a quiet place at the heart of so many places of culture as Florence, Siena, Pisa, Lucca, Volterra and San Gimignano . The municipal swimming pool, which enjoys a beautiful view of the valley, is located only 400 meters from the apartment. For lovers of trekking and mountain biking a network of trails allows to visit all the forests of the area. Finally, near Chianni (7 km.) il located the country is Casciana Terme, a country known primarily for the thermal plant that receives water lime-sulfur at 37° C constant.